The concept of microgrids is starting to pick up and we even have a blog post to share some exciting work that a member of the team is involved in along these lines. 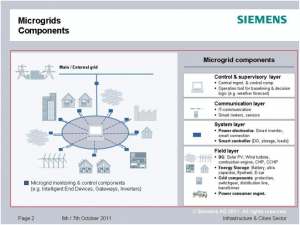 But first, what are microgrids? Microgrids are small-scale versions of the centralized electricity system. Our view of the future of the industry is one that will see more of a reliance on a microgrid than the current centralized system. Microgrids have up until this point been thought of as backup energy systems to provide your electricity should your primary source of electricity fail or be cut off. As the technology improves it benefits the society in terms of less of a reliance on the main grid (which would be beneficial with general outages that happen due to storms) and carbon offsetting (microgrids tend to be solar, wind or other renewable based energy sources). Companies in the electricity are starting to pay more attention to the growth of this space and picking the segment of the microgrid industry that they have the best chances of succeeding in. 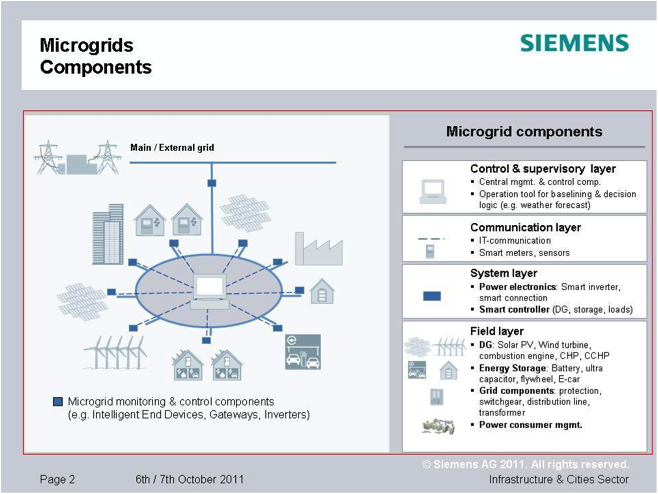 Big companies like Siemens (from the image above) are coming up with components to monitor and control the microgrids. The more exciting ideas, and even more micro ideas, are coming from design firms like Frog Design who have chosen a product like Revolver. 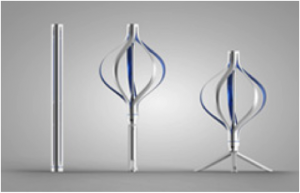 Revolver is not quite a microgrid component but more of a do it yourself wind energy source that delivers enough power for mobile and electronic devices. 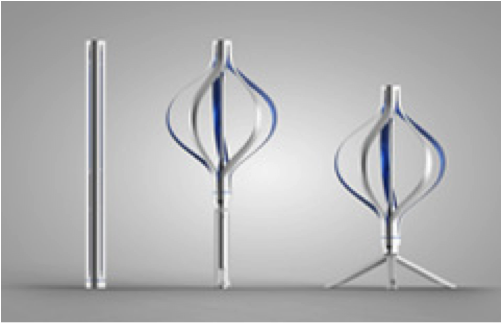 The product is easily transported, is well designed and won the prestigious Braun prize sustainability Award for 2012. Key to the increasing adoption of Microgrids is the applicability of the solution to many urban settings across the country; microgrids are very useful for communities like university campuses that have peculiar usage profiles due to students’ odd hours, military bases where the security of the base is tied to the electricity supply and usage, off grid locations (again for the military), research institutes with energy sapping experimental procedures and off course municipalities. The main difficulty and hurdle to the adoption of microgrids is the requirement, in some cases, for integration into the current grid infrastructure, which still requires upgrades. We’ll be keeping our eye on this emerging trend due to the impact it will have on the markets, the utilities and the choices that consumers will have to make about where they will get their electricity supply from.